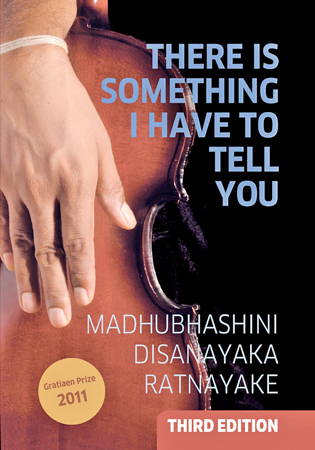 The third edition of the novel There is Something I Have to Tell You by Madhubhashini Disanayaka Ratnayake, which won the Gratiaen Prize in 2011, was launched by Sarasasvi Publishers on April 3 at Stall No 1, at the Innovate Sri Lanka Exhibition held by the University of Sri Jayewardenepura at the BMICH, to celebrate its 60th Anniversary. It was presented formally to Professor Sampath Amaratunge, Vice Chancellor of the University of Sri Jayewardenepura, Dr Harini Amarasuriya and Dr Harshana Rambukwella of the Open University and HD Premasiri of Sarasavi Publishers, at the stall. All of Madhubhashini Ratnayake’s works which include three collections of short stories (Driftwood (State Literary Award 1991),Tales of Shades and Shadow (Gratiaen shortlist -2002), A Strange Tale of Love (Gratiaen Shortlist - 2004); two language teaching books (Grammar Through Literature and A Thousand Voiced Choir) and five trilingual readers for children (Play with Me, Learning, Tell me the Truth, Stand in Line and Keeping Things in Place) will be available for sale at exhibition on April 3 from 9 am to 9 pm. Madhubhashini Disanayaka Ratnayake is a Senior Lecturer in the Department of English Language Teaching at the University of Sri Jayewardenepura. The Innovate Sri Lanka Exhibition is being held by the university at the BMICH to celebrate its 60th Anniversary by showcasing the innovations and achievements of its staff and students and many new creations will be on display during this time.